December 5, 2016 ~ Lorra B. 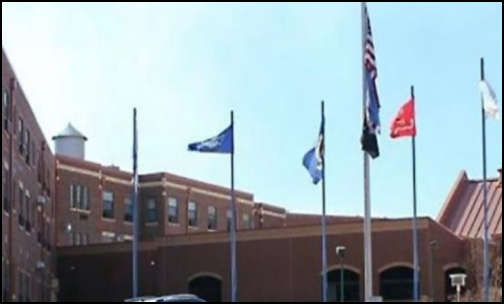 Four employees of the Oklahoma VA Hospital have quit their jobs after live maggots were discovered in the wound of a veteran being treated there. The veteran, 73-year-old Owen Reese Peterson, came into the hospital with an infection and the cause of death, according to Executive Director Myles Deering, was not due to the parasite infestation. “He did not succumb as a result of the parasites,” said Deering. Tulsa World Reported that sepsis, a complication from infection that is life-threatening, is the cause of Peterson’s death. It is reported that Peterson’s son, Raymie Parker, pled with the hospital to do something for his father. Those resigning their posts include the director of nursing, a physician’s assistant and three nurses. They chose to resign before any of them could be fired for their incompetence. Spokesman Shane Faulkner stated that the Oklahoma State Department of Health was notified along with the district attorney for Latimer and LaFlore counties. It is yet to be known if charges will be filed. The Deering VA is almost 100 years old with just as many problems facing it including millions of dollars in repairs and the inability to find and keep staff members, according to Rep. Sen. Frank Simpson. A report on the incident was denied because it is said to contain “identifying information that is prohibited by law from being released,” according to the Oklahoma State Department of Health. November 23, 2016 ~ Lorra B. 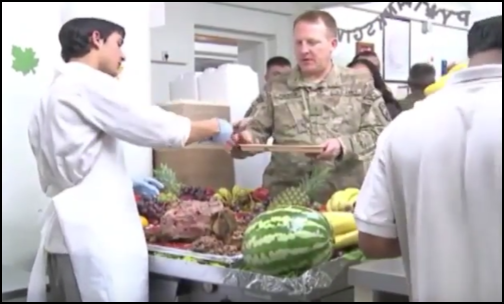 The Defense Logistics Agency is committed to providing American troops around the world with a traditional Thanksgiving meal and this year is no exception. In Afghanistan, there are 10,277 active duty troops serving, according to Defense Department statistics. In Afghanistan, Kuwait, Jordan and Iraq there are nearly 12,000 troops deployed. These numbers don’t include other countries or the service members at sea. Understandably, getting ready to deliver that many Thanksgiving feasts takes time and skill. There are, according to DLA, 34,760 pounds of turkey, 21,450 pounds of ham and 32,550 pounds of beef to be prepared! Not to mention the 28,980 pounds of shrimp, 9,114 pounds of stuffing mix and 879 gallons of eggnog. That is a lot of food to prepare and it takes expertise to get it organized. If you are a soldier with a meal card, there is no charge for this feast. Soldiers with an E-5 and below, and their families, pay $6.80 per person. Enlisted E-5 and below, and their families, along with officers, pay $9.05 per person. There will be all the fixings for our troops from collard greens, sweet potatoes and mashed potatoes to cheesecake for desert. Thanks to the Defense Logistics Agency, our troops around the world will be enjoying a warm Thanksgiving meal and while it will not in the least compare with being home for the holidays it will at least give them a warmth in their hearts and a small taste of home. We thank each and every one of our brave heroes who put their lives on the line every day, though ‘Thank you’ will never be enough! November 22, 2016 ~ Lorra B. A Defense Department directive was approved on Nov. 18 allowing U.S. military members to carry concealed handguns for protection at government facilities. The directive was approved by Deputy Secretary of Defense Robert Work and is a blue print for the policy that allows “DoD personnel to carry firearms and employ deadly force while performing official duties,” reports Military.com. As part of their job requirements, service members already are permitted to carry weapons but the new policy allows them to carry their personally owned guns. In order to qualify to carry a concealed weapon on DoD property the applicant must have a valid license to carry and be 21 years of age. Not everyone is happy about this new concealed carry policy. Arguing against the new policy, Army Chief of Staff Gen. Mark Milley stating that during shootings such at the Nov. 5, 2009 mass shooting at Fort Hood, Texas, police were on the scene and had it secured in a very short time. Milley is not convinced that soldiers being armed would have stopped Nidal Hasan from killing 13 people and injuring 42. Lawmakers, however, disagree and have questioned whether military members might have been able to stop Hasan, and other previous military shootings, had they been armed. After an argument in April, 2014, Spc. Ivan Lopez-Lopez went on a killing spree at Fort Hood killing three soldiers and wounding 12 others. 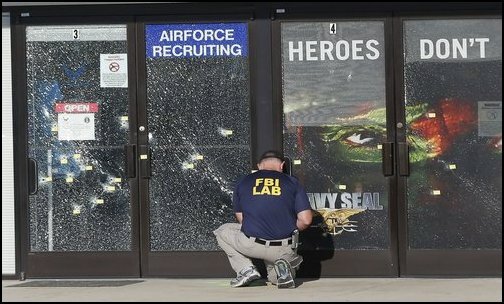 July 16, 2015, Muhammad Youssef Abdulazeez, killed four Marines and a sailor at two military bases in Chattanooga before being shot to death by police. Any service member who is authorized to carry a privately-owned gun will “acknowledge they may be personally liable for the injuries, death, and property damage proximately caused by negligence in connection with the possession or use of privately owned firearms that are not within the scope of their federal employment,” the document states. Perhaps loss of life will be kept to a minimum the next time a terrorist decides to open fire on DoD property. November 21, 2016 ~ Lorra B.
Stewart Perry, a former Marine, along with his wife and daughter, were on an American Airlines flight last Monday to pick up the remains of their son, a soldier who was recently killed in Afghanistan. Their solemn flight took an even more grievous turn, however, when passengers allegedly booed the family while on the flight. First class passengers reportedly complained and booed saying that letting the Gold Star family deplane first was ‘baloney’ considering what they had paid for their first-class seats. Perry stated that he was unaware if those sitting in coach had complained or booed or if any of them knew there was a Gold Star family on the plane. 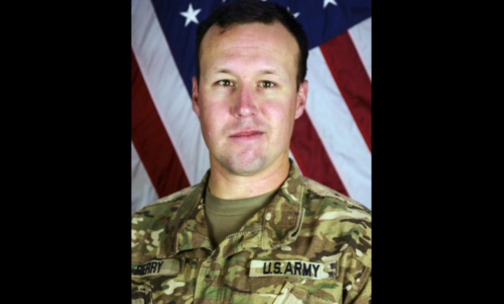 The 30-year-old Army soldier died on November 12 at Bagram Airfield from injuries sustained from an improvised explosive device, an attack by a suicide bomber. Perry was one of two killed that day. He was honored in Lodi and will be buried in Arlington National Cemetery. Perry leaves behind a wife and two young children. He died a hero, his father said. November 18, 2016 ~ Lorra B. The Combined Federal Campaign (CFC) is dedicated to helping different charities that help our four-legged friends. 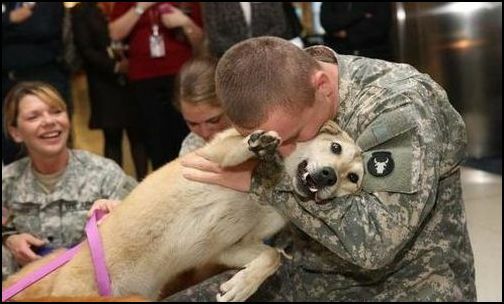 Donations to the CFC help organizations such as Pets for Patriots and this goes a long way in caring for our veterans. Pets are known for helping symptoms such as Post Traumatic Stress Disorder (PTSD) by reducing stress, lowering blood pressure, reducing anxiety and actually boosting the immune system, according to Elements Behavioral Health. Having a pet to care for helps take the focus off the experiences the veteran has gone through by focusing on the pet’s needs. CFC founder and executive director, Beth Zimmerman, stated that the foundation is a lifeline of support for both the pets and the veterans who adopt them. The foundation began in 2010 and have helped to give “the most overlooked and undervalued dogs and cats a home,” Stated Zimmerman. Though the veteran is responsible for the adoption fee, discounts and waivers are offered. When a veteran adopts one of these ‘last-chance’ pets, a gift card of about $150 is sent to them. Also, available to the veteran and their new pet is “ongoing veterinary care from veterinarians in the network who agree to give a discount of at least 10 percent” as well as other retailer discounts. Since 2010 many lower-income veterans and elderly veterans have been involved in the adoption of over 1,209 pets. If they cannot afford to pay for their pets needs because of a temporary hardship, there are programs to assist them. Through their various programs last year, 447 who needed assistance with adoption where helped. The price tag for that assistance was $72,640. So far, this year Pets for Patriots has spent $11,300 for veterinary care alone. Pets can be a huge part of a veteran’s healing process. There are no prejudices from a pet and they will accept the owner without noticing or caring if their human is disabled or impaired in any way. Their devotion is 100 percent and an incredible source of comfort and attention. If you are interested in either giving to or adopting a pet from Pets for Patriots click here. November 17, 2016 ~ Lorra B. A bill to renew an Iran sanctions law and go after supporters of Syrian President Bashar Assad’s government has been approved by the House on Tuesday. The bill calls for punishing those who financially back the Syrian government and “maintaining economic pressure on Tehran,” according to Associated Press. 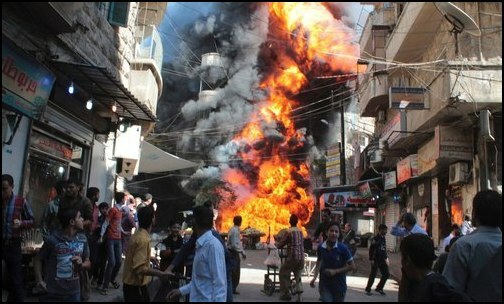 The violence in Syria is in it’s sixth year and has seen almost 500,000 people killed. This has contributed to “Europe’s worst refugee crisis since World War II and given the Islamic State group room to grow into a global terror threat.” The Assad government now stands accused of war crimes. The bill would sanction countries like Russia and Iran that provide funding or do business with the Syrian government. Last month, Secretary of State John Kerry wanted an investigation into Russia and Syria for war crimes, “a move that escalated already heated rhetoric against Moscow for its part in a deadly military offensive in Aleppo, Syria’s largest city, and its longstanding support of Assad,” reports AP. In 2014 a Syria defector testified before the Foreign Affairs Committee that he bore witness to a ‘genocidal massacre’ of over 10,000. He is said to have images of the slaughter. President Barack Obama, according to Kerry, will sign the renewal bill. If approved the bill, which first passed Congress in 1996, will extend the law to 2026. If it is not signed it will expire come years’ end. Should the bill be extended, the U.S. will be allowed to punish Iran if they fail to live up to the terms of last year’s Iran Nuclear Deal. The House cleared the Iran Sanctions Extensions Act by a vote of 419-1. The only Congressional ‘No’ vote on the bill came from Rep. Thomas Massie, R-Ky.
November 16, 2016 ~ Lorra B. 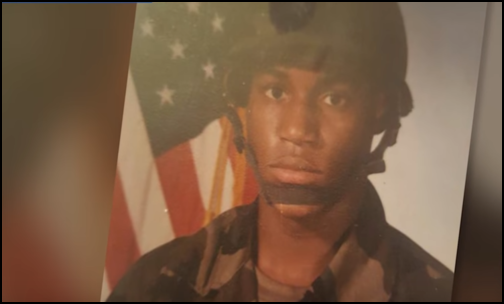 Earnest Walker, 47, and his service dog, Barack, arrived at Chili’s Grill & Bar in Cedar Hill to claim his free Veterans Day meal and what happened next is inexcusable. According to Walker, a Chili’s customer claimed he was not ‘a real soldier’ because he was wearing his hat indoors. After being questioned Walker provided ID as well as his discharge papers. Walker’s waiter allegedly indicated that he had been in Germany and that blacks were not allowed service there. It just so happens that Walker is a black man. The manager of Chili’s then came to the table and told Walker that his dog was not a service dog, reported Dallas News. Not sure exactly what was going down, Walker decided to turn his cellphone camera on. The National Archives and Records Administration verifies that Walker served proudly in the Army from 1986 to 1988. He was stationed in Hawaii, 25th infantry Division. Walker’s attorney, Kim Cole, stated that Chili’s called and apologized to Walker. The manager was put on leave and would not comment on the incident. November 15, 2016 ~ Lorra B. Due to the inability to come up with a cohesive plan to cover the exorbitant cost, the VA has squashed the rule change that would have allowed gender reassignment surgeries. Gender reassignment is a very expensive undertaking and, according to the Transgender Law Center, surgeries can be between $25,000 and $100,000. Taxpayers have very mixed feeling on the issue and just how their tax dollar are and should be spent. In 2011 President Barack Obama made clear that costs were to be taken into consideration when suggesting rule changes. Because the VA did not submit a plan to cover the cost of the reassignment surgeries the rule was scrapped, though plans for funding are still in the works. No view has been stated by the Trump administration on the issue of government-funded gender reassignment surgeries or their care. November 14, 2016 ~ Lorra B. The California National Guard finds itself in the news once again as those enlisted by them come forward with accusations of non-payment. 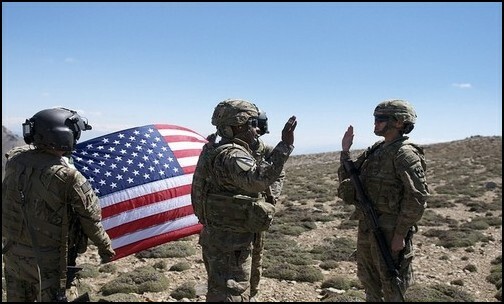 Last month the California National Guard was in the hot seat when the Pentagon demanded repayment of reenlistment bonuses they gave to almost 10,000 National Guard soldiers as incentive during the height of the Afghanistan and Iraq war 10 years ago. Now, others are coming forward with accusations of more California National Guard wrongdoings. In frantic need of interpreters to go with troops to Afghanistan and Iraq, the California National Guard also guaranteed enlistment bonuses to “dozens of Arabic, Dari and Pashto speakers” of up to $20,000 each, according to Tribune News Service. It was called the 09 Lima program. The Pentagon was so desperate for interpreters in battle that they were utilized whether they were or were not qualified or even if they were in failing health. Now many are complaining of combat injuries, post-traumatic stress disorder and that they can’t work. As far as the interpreters are concerned, the Pentagon broke their commitments. Khatchig Khatchadourian, an Arabic interpreter from Los Angeles, stated, “As far as I know, it’s only the interpreters who didn’t get paid. They think we’re stupid because we are immigrants.” The California Guard has not paid Khatchandourian the remaining $10,000 he says is owed him. According to Col. Peter Cross, a spokesperson, there are 44 interpreters affected by this non-payment. The Pentagon needed these interpreters in the field as soldiers so that they could not quit or refuse to go into dangerous situations like contractors could. “To meet that goal, the Pentagon in 2006 ramped up the 09 Lima program. It offered special bonuses, eased enlistment standards and even accelerated U.S. citizenship applications for immigrants who agreed to join the Army,” reports Tribune News Service. Many who were promised bonus, however, were told they were no longer eligible because they had failed some aspect of required recruitment testing, such as the aptitude test or the physical fitness test. Yet, these soldiers were sent to war and performed their duties…they did their time. The California National Guard and the Pentagon made promises to brave soldiers who put their lives on the line and then ripped then away. The country and the world are watching. If we have no integrity within our military where does this leave us as a country? 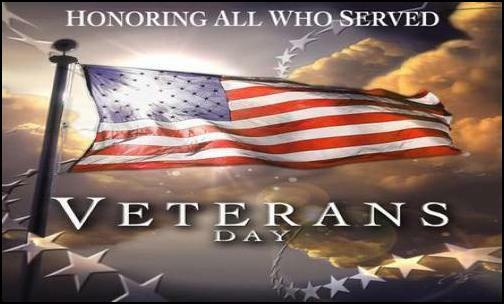 Veteran’s Day Deals and Steals – Happy Veteran’s Day! November 11, 2016 ~ Lorra B. Today we honor all those who serve this great nation of ours – past, present and future. Thank you for your selfless service and many sacrifices…sacrifices that most will never fully understand. Veterans, today we honor you! The following is a list of deals and steals was compiled by WTHR News. We hope you take advantage of the various places of business who wish to honor you. Applebee’s – Applebee’s is offering a free meal to all veterans and active duty military personnel on Veteran’s Day. See the menu here. Bob Evans – Bob Evans Restaurants are offering free select menu items to Veterans and Active Duty Military on Veterans Day, Friday Nov. 11, 2016. In addition to the meal, Bob Evans will offer a 10% discount from November 12 – December 31 for both dine-in and carryout meals. Read more here. Chili’s – Chili’s is offering a free meal from a special menu of five choices, and is available for not only veterans but also active duty military members.Read more here. Chipotle – Chipotle plans to honor veterans and active military personnel with a buy-one-get-one (BOGO) deal on Friday Nov. 11. All active duty military, reserves, national guard, military spouses, and retired military will receive a free burrito, burrito bowl, order of tacos, or salad when they purchase an entree and show a valid US military ID or veterans ID at Chipotle locations nationwide. The deal is good from 3pm (local time) to close. Read more here. Chuck E. Cheese – Chuck E. Cheese is offering multiple deals involving pizza and tokens. Read more here. Cracker Barrel Old Country Store – Cracker Barrel will offer veterans a complimentary piece of Double Chocolate Fudge Coca-Cola Cake for desserton Nov. 11 at all Cracker Barrel Old Country Store locations to thank them for their service and sacrifice. They will also be accepting donations for Operation Homefront. Denny’s – Denny’s offers a free “Build Your Own Grand Slam” on Nov. 11 from 5 a.m. to noon for active duty, retired and other veterans. Includes four breakfast items such as buttermilk pancakes, eggs cooked to order, bacon strips, seasonal fruit or hash browns. Show a military ID. Available at participating locations. Famous Dave’s – Get a free Two Meat BBQ Salute, your choice of two from ribs to cod, on Nov. 11. Golden Corral – Golden Corral will be offering a free “thank you” dinner on Monday Nov. 14. Any person who has served in the US Military (retirees, veterans, active duty, National Guard or Reserves) is eligible. Learn more here. Hooters – Hooters is offering a free meal to all active duty and retired military on Nov. 11. Click here to read more. IHOP– IHOP will be serving free Veterans Day Pancakes on Friday, Nov. 11. This year IHOP will be honoring veterans and active military men and women with a free stack of Red, White, and Blue pancakes. To donate and read more, click here. Krispy Kreme – Krispy Kreme offers veterans a free doughnut and a small coffee. LongHorn Steakhouse – LongHorn Steakhouse will offer a free appetizer or dessert (no purchase required, no restrictions) to anyone showing proof of military service. In addition, LongHorn Steakhouse will offer 10% off for guests that dine with Veterans on November 11. Max & Erma’s – Max & Erma’s will be offering a free burger, fries, and a drink at participating locations on Nov. 11. Olive Garden – Olive Garden has a special menu features six of Olive Garden’s most popular items. Entrées are served with unlimited homemade soup or famous house salad and warm, garlic breadsticks. At participating locations only. On the Border – On the Border will be serving free lunch to active and former military members. Outback Steakhouse – Outback Steahouse is offering a free Bloomin’ Onion and beverage for military personnel. All military members and their families also get 15% off their entire check from November 12 to December 31, 2016. Perkins – Vets get a free Magnificent 7 breakfast. Red Lobster – Red Lobster will be having a free appetizer or dessert on Thursday, November 10 and Friday, November 11, 2016. Red Robin – Red Robin is thanking veterans with a free Red’s Tavern Double Burger and Bottomless Steak Fries. Ruby Tuesday – Free appetizer (up to $10) for vets, active duty and reserves. Texas Roadhouse – Texas Roadhouse will have free lunch in honor of Veteran’s Day. TGI Fridays – TGI Fridays is offering veterans a free lunch between 11 am and 2 pm on Nov. 11. Twin Peaks – Twin Peaks is giving a free menu item to veterans on Nov. 11. Cabela’s — Increased discount for military personnel as well as law enforcement, irefighters and Emergency Medical Service personnel. Great Clips – Great Clips is offering a free haircut card to veterans who come in to a Great Clips salon. Veterans can choose to get a haircut that day or at a later date with the card. Read more here. Home Depot — Home Depot offers a 10 percent discount to all veterans. Home Depot offers 10 percent discount year-round to for active duty and retirees. Lowe’s – All veterans receive a 10% discount on Veterans Day, Nov. 11. The offer is available in stores only. Meineke – Meineke will be offering a free basic oil change for veterans and active duty personnel on Nov. 11. Click here for more info. National Parks – On Veterans Day, veterans will have free access to over 100 national parks that require entrance fees. Rack Room Shoes – Military personnel and their dependents get a 10 percent discount off entire purchase Nov. 11. Sport Clips – Participating locations are offering veterans and active duty service members free haircuts on Nov. 11.